Norm and Betty Jo Cash, owners of Onsite Auto Glass, will be collecting food and non-perishable items for the family of 4-year-old Kaden Fecteau of Casco until mid-July. On August 18, 2015, Kaden “was diagnosed with stage 3 Rabdomyosarcoma. The tumor was is his ear, and putting pressure on a nerve in the right side of his face. The tumor had wrapped itself around the bone which initially made it inoperable. Kaden underwent treatment to reduce the size, to allow surgery. Kaden and his family have taken multiple journeys to Boston, and spent many nights at Maine Medical. Initially things went well, then the tumor was found to have new growth. This is extremely rare. The decision was made to operate. Baby Batman (Kaden’s nickname after his favorite superhero) came through the surgery like a champ. But, unfortunately this type of cancer is expected to return if left alone, Kaden continues to undergo treatment. Oncologists give him a 30 to 40 percent chance of survival, and a poor long term survival rate,” said a statement from family friends. “To look at him you would never know he’s sick. He’s a very active, happy go lucky kid. His smile is contagious,” Betty Jo said. The family and Kayden’s parents Michael and Elizabeth Fecteau, are no strangers to adversity. Kaden has a 15-year-old brother and a 10-year-old sister, who has Rett Syndrome. Rett syndrome is a rare genetic neurological and developmental disorder that affects the way the brain develops, causing a progressive inability to use muscles for eye and body movements and speech. It occurs almost exclusively in girls. The Cash’s heard about Kayden last September, when their trash man John Scott, of Scott’s Disposal was doing a bottle drive to raise money for the family. At Christmas time, through 50/50 raffles and more bottles, friends were able to raise between $1,700 and $1,800 to help the family through the holidays. “He’s getting worse. It’s not a good outcome unless a miracle happens,” said Betty Jo. Junior and Sani Design as well as Active Health Performance Therapy and Onsite Auto Glass are all collecting items for the family “to make it a little easier on them,” said Betty Jo. They are collecting non-perishable items and gas cards, food and toiletries. Items can be dropped off at Onsite Auto Glass, 700 Gray Road in Windham during work hours, or at Active Performace Therapy, 512 Warren Ave. in Portland. Onsite Auto Glass is accepting food until July 10. 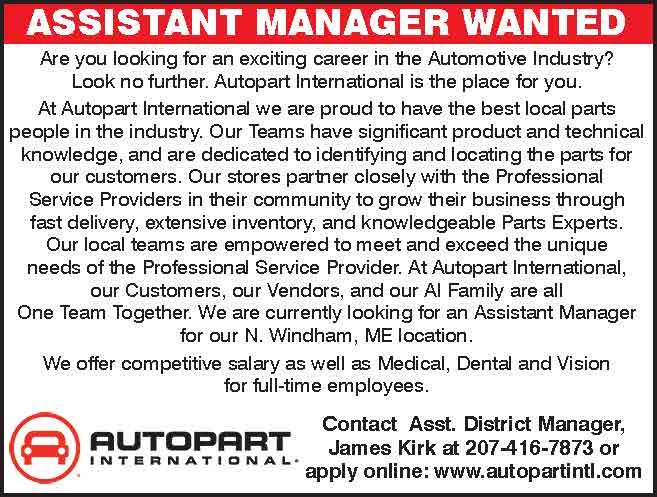 FMI, call 207-318-0711. 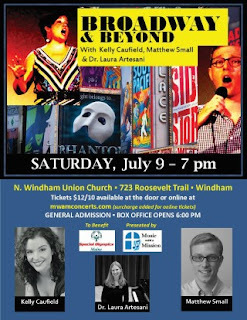 On Saturday, July 9th, at 7:00 p.m., two of the Lakes Region’s favorite singers, Kelly Caufield and Matthew Small will return to perform Broadway & Beyond at the North Windham Union Church. This is the fourth time that Kelly and Matthew have performed here in July, and every year they draw a large crowd. 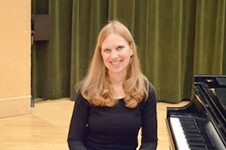 This year, they will be accompanied again by Dr. Laura Artesani, a talented pianist and associate professor of music at the University of Maine. These New England-based entertainers have been performing songs from the stage together for more than a decade. Audiences love their personal, moving interpretations of musical theater, pop, standards, folk and more. 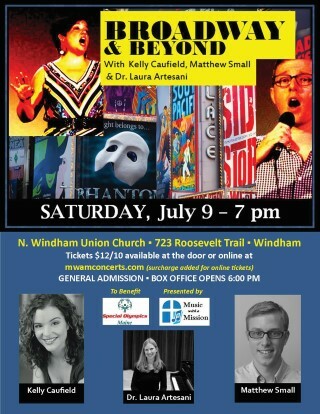 “We are delighted that Kelly and Matthew are performing back in Windham again this summer,” said Dr. Richard Nickerson, Minister of Music for NWUC. We hope to see lots of familiar faces and look forward to welcoming our summer visitors who will discover these special talents that Mainers have enjoyed for years!” Please join us for a cool, comfortable concert to enjoy Broadway & Beyond while supporting our community and Special Olympics Maine! This concert is the 36th in the “Music with a Mission” series sponsored by the North Windham Union Church. The church donates a portion of the proceeds to area non-profits, and so far we have raised nearly $37,000 for mission support to the church and other community organizations. The Broadway & Beyond performers have once again decided to support Special Olympics Maine with the community proceeds from this concert. Tickets will be sold at the door and are $12 for adults and $10 for students, children, and seniors. Tickets are also available in advance on-line at www.mwamconcerts.com . The box office opens at 6 p.m. and the doors will open at 6:30 p.m. The North Windham Union Church is located at 723 Roosevelt Trail in Windham, and is air-conditioned for your comfort. For more information, call 892-7149 or email MWAMconcerts@gmail.com. There are over 400 million Instagram users searching, liking, and commenting on photos every month and if you’re like most business owners, you’re trying to figure out how to take advantage of this massive market. Below are three tips to help you increase your interaction, followers and return-on-investment. 1. Consistency: Remember that time you forgot to water your plants and all of the sudden your beautiful tomatoes strain began to look like they had been in your garden since Elvis last sang live? It wasn't because there was a problem with the seed, soil, or lighting - it was because you forgot to water and feed it on a regular and consistent basis. Plants, much like Instagram, need consistent daily attention. Plan to post a new well-lit photo at least four times a week. This trains your audience on what to expect from you and also helps you stay top of mind! 2. Use Hashtags: Instagram users find photos and companies they want to interact with by searching hashtags. Unless you’re a major brand that has an organic following you should too. Think about what hashtags make sense for your product or service and include then in the comments section below your photo. Remember, you can use up to 30 hashtags per photo! Bring on the #hash! 3. Search by location: Do you serve a local market? If so, you should be liking and commenting on photos that were taken nearby. It’s easy to do. Simply open Instagram, click the little microscope, click the “search” bar, and now click “Places” all the way to the right. Your first option will be, “Near Current Location.” Click that and now you will see all the photos taken near your current location! The most important thing to remember is be helpful and stay human! Have fun watch your following grow! One of my favorite seasons is just around the corner… strawberry season! Whether you pick berries at a local farm, buy fresh at the farmer’s market, or enjoy strawberries right from your own garden, there’s no denying that this time of year is delicious. But the strawberry season is only a few short weeks, and often it’s gone before we know it. So how can you enjoy the bright summer taste of strawberries all year long? This year, consider preserving some of the berries you pick! Strawberries can be preserved using a variety of techniques including freezing, dehydrating and canning. Regardless of which method you choose, be sure to use ripe, freshly picked berries. Strawberries are best when preserved on the day you bring them home, so you will want to set aside a little extra time after returning from the U­pick. In my opinion, there’s no better way to capture the flavor of summer than with strawberry jam. Homemade strawberry jam is a classic treat, and it’s a great place to begin if you’re just getting started in the world of home canning. Canning fruit like strawberries can safely be done using a hot water bath, which simply means that jars of the prepared berries are submerged in boiling water for a set amount of time to allow the jars to seal. You can easily pick up the necessary equipment at hardware or farm supply stores, or at big box stores. You will need a large stock pot, a rack to keep the jars off the bottom of the pot, and glass jars with two­ piece lids made specifically for canning. It is also helpful to have a funnel for filling the jars and tongs or a jar lifter for removing hot jars from the canning pot. Once you have these tools, along with your freshly picked strawberries, you’re ready to start making jam. When choosing a jam recipe, it’s best to use a trusted source that relies on the most up ­to ­date food safety information. Today, let’s take a look at making jam without added pectin using a recipe from the UMaine Cooperative Extension. For 4 cups of prepared berries, you will need to clean and sterilize 4-half­pint or 2-pint jars by boiling them in your canning pot for 10 minutes. Prepare your strawberries by hulling and crushing them. Mix the berries with 4 cups of sugar and bring them to a boil while stirring continually. As you continue to boil the mixture, the jam will begin to thicken. Use a jelly or candy thermometer to determine when the jam is ready to go into jars. At our elevation of less than 500 feet, the mixture will need to reach a temperature of 220 degrees F. If you don’t have a thermometer, you can also place 2 tablespoons of jam on a cold plate and chill it in the freezer for 2 minutes. If the mixture gels, it’s ready to go into jars. Fill your jars with the hot jam, leaving ¼­inch of head space, or empty space, at the top of the jar. Wipe the rim of your jar with a clean, damp cloth before applying the 2­piece lids. Place the flat lid on top, and then apply the screw band, only tightening it with the tips of your fingers. Place your filled jars back in the canning pot, and bring the water back to a boil. Leave the jars in the boiling water to process for 5 minutes, then turn off the heat and remove the jars from the canning pot. Do not adjust the screw bands, simply place the jars on a towel or rack to cool for 12-24 hours. Once the jars are cooled, you need to remove those screw bands to make sure that you’ve got a good seal between the jar and the flat lid. This seal is what will keep your jam preserved through the coming year, assuming that you don’t eat it all right away! Making jam is just one of the ways you can savor this year’s strawberry harvest. Similar food preservation techniques can be used for most summer fruits and berries. If you’re interested in learning more about canning, there are many opportunities available. 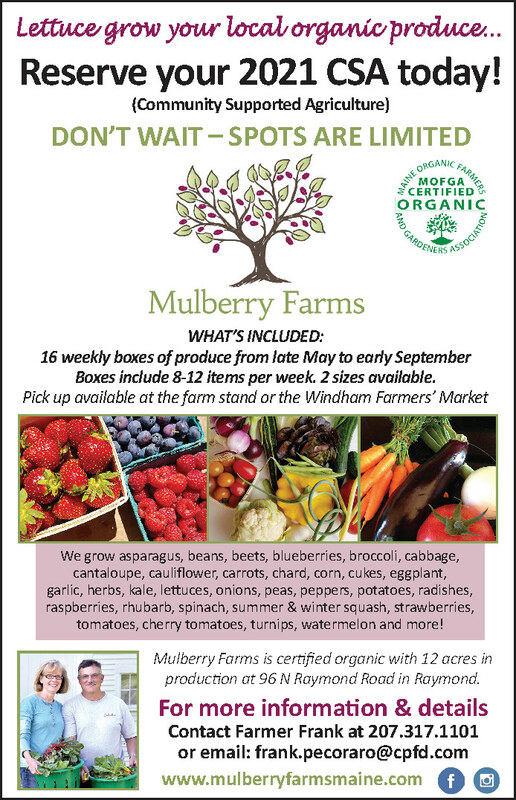 I suggest taking a class through the UMaine Cooperative Extension, or picking up a book on the latest canning information. The world of food preservation is full of ways that you can keep the flavors of summer with you throughout the year. Let’s dig in! 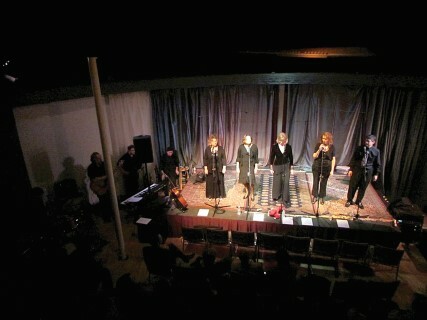 The North Windham Union Church will feature Rock My Soul Five after the original show was snowed out in January. The five vocalists that make up Rock My Soul Five are the core of a larger gospel choir, Rock My Soul. The choir performs throughout New Hampshire, Massachusetts and Maine, with a repertoire that spans a wide range of gospel music both historic and more contemporary. The group is secular, meaning that although they sing gospel, the music isn’t preaching or conveying a religious message, said McBride. Instead, Rock My Soul Five focuses on educating the audience about the history of gospel music and how it evolved, including its roots in slavery and the civil rights movement. McBride said the organization’s mission aligns closely with that of the concert series, and the nonprofit even uses the tagline “music with a mission” on their website and promotional materials. “It felt like there was some natural connection there that we wanted to explore,” he said. 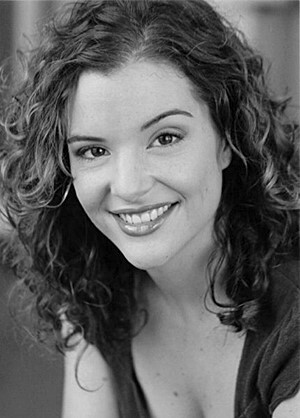 A portion of each concert’s proceeds is given to an area charity selected by the performers. The community proceeds will support ProjectMusicWorks, helping them bring music to those in need. ProjectMusicWorks provides high quality, live musical performances at nursing homes, hospice facilities, counseling centers and other community programs where people may not otherwise have access. The committee strives to provide a good range of acts, mostly local, in a cost effective way to keep ticket prices low and still give back to the nonprofits and raise money for the church, McBride said. Tickets for Rock My Soul Five will be sold at the door and are $12 for adults and $10 for students, children, and seniors. Tickets are also available in advance on-line at www.mwamconcerts.com . The box office opens at 6 p.m. and doors will open at 6:30 p.m. The North Windham Union Church is located at 723 Roosevelt Trail in Windham. For more information, call 892-7149 or email MWAMconcerts@gmail.com.